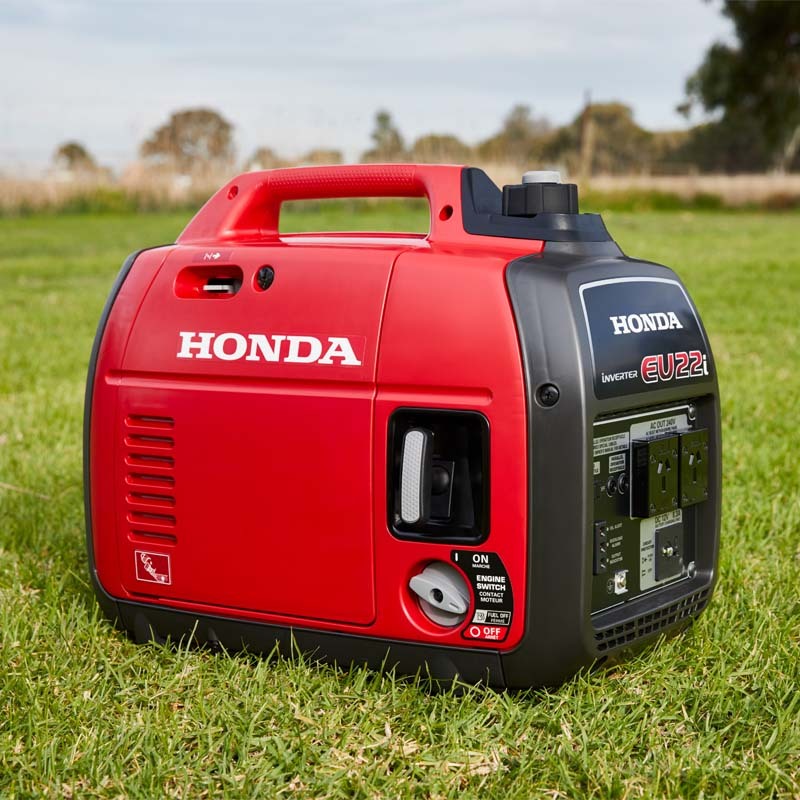 For years, Honda have led the way in power generators, especially when it comes to the camping and caravan industry. In the five years we have been travelling full time on the road, without doubt the most common generator we have seen pulled out of many a caravan is the Honda EU20i unit. It’s small, powerful, quiet and very very reliable. And now, after 15 years, Honda have improved on the EU20 model, with the brand new EU22i model. As mentioned, they recently gave us one to try out so we could see firsthand the improvements and compare it to the EU20i. Over the recent Easter weekend, we took it out to the Murwillumbah Showground and ran it through its paces and have to say we were quite impressed. We filmed our first test run live so you can see it in action and how it performed in powering up a New Age caravan. Since then we have been playing around with it even more and I have now prepared a review of the EU22i and what we thought of it. A huge part of keeping your Genny running at peak performance is servicing, you can get it done with an authorised dealer, or you can do it yourself. In the EU20 model, changing the oil could be a trifle tricky at times, as the oil access was built deep into the unit, and quite narrow. In the Eu22i model, you will see they have made the opening larger and added a small black rubber lip that protrudes further out of the body, which allows for easier access and drainage. This means less mess and chance of oil going back into the unit. Its just a matter of tipping the Genny over to empty the oil and letting it drain out. The EU20 model had no protection around the recoil cord area, which meant that if the cord was pulled on an angle as it often can be, it would actually start cutting into the plastic housing over time. To alleviate this, the EU22i has a metal guard around the cord area which protects it from being damaged. This one is a beauty, and something I learnt the hard way. Years ago, I had a Honda whipper snipper which I didn’t’ use for over 6 months. Unbeknownst to me at the time, I stored it without running the fuel out of the carburettor. When I went to start it again, there was no way it was going to happen. Why? When you leave fuel in the carbie it goes stale and sticky. So sticky in fact that it can attach itself to the walls of the carbie and is very hard to clean. Sometimes, to the point where you cannot clean it and have to replace the whole carbie. A very expensive exercise, trust me. But with the EU22i they have built in a Run Dry switch. This is different to the OFF switch which will just turn the Genny off, the Run Dry switch will actually use all the fuel that is left in the fuel line and carbie until it runs out, therefore leaving the carbie clean, unblocked and ready to go again even if you have to leave it for quite some time. The final improvement of course is in the power it now delivers, the EU22i has 200 watts more power than its predecessor. With the average camper now using more appliances, and with appliances increasing in power consumption, the extra 200 watts can make all the difference. It means you can actually run more appliances over a shorter period of time, instead of in some cases having to run them one at a time. So, instead of waiting for the washing machine to finish before charging the batteries, you can now do both. 200w may not seem like much extra, but it can certainly make a difference, for example in our live broadcast, we showed the new EU22i actually boiling a 2300 Watt kettle. The engine in the EU22i is a 4 stroke engine, which basically means there are four strokes to a complete revolution instead of 2 strokes. This allows it to deliver maximum power but still run very quietly and use less fuel, about 30% less than 2 stroke motors. So when camping this is imperative, as we want to be as quite as possible so as not to piston off the neighbours. All Generators need oil to operate efficiently, and as you use them, they will undoubtedly use oil. 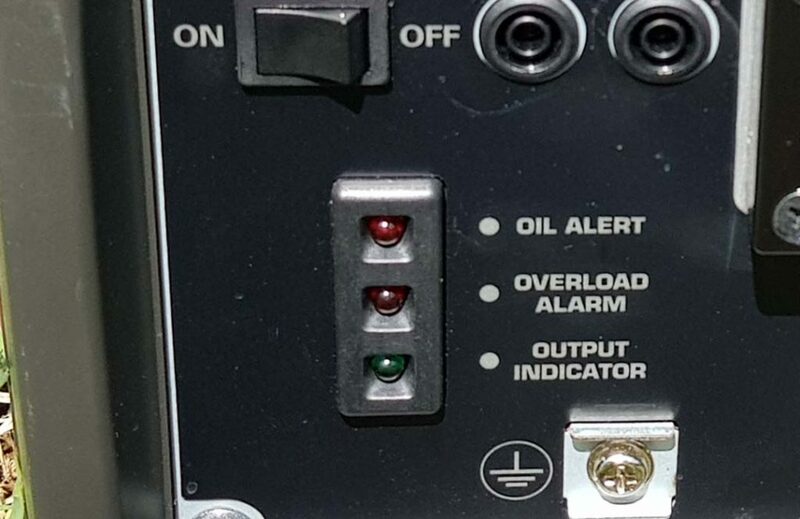 All the Honda Generators are fitted with an oil alert system. 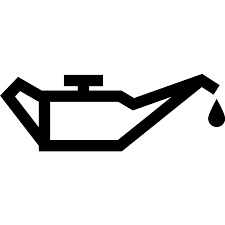 Therefore, if for any reason you run low on oil, the engine will shut down to save permanent damage. The EU22i model has a built in inverter. An inverter is basically a device or apparatus which converts direct current into alternating current, or DC power to AC power so you can run 240 volt appliances. 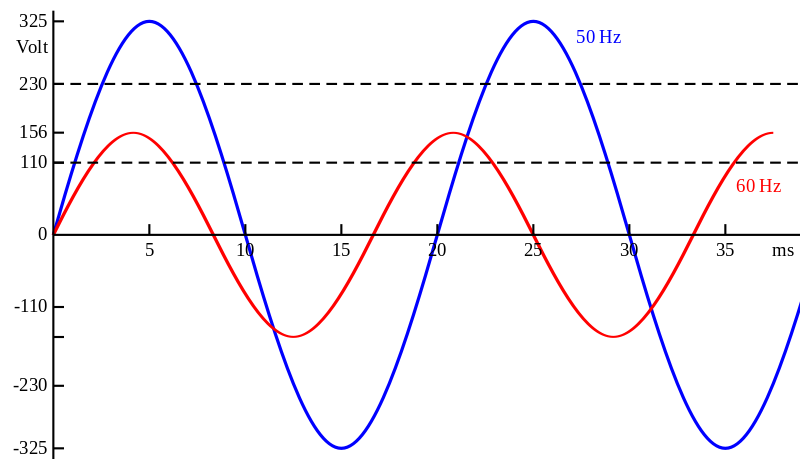 There are two types of inverters, what they call modified sinewave or pure sinewave. Of these, pure sinewave is the better, as it produces cleaner electricity which in turn helps protect your electrical items from electrical spikes. The EU22i runs a pure sinewave inverter making it ideal and safe to charge things such as laptops, smartphones, iPad’s & TV’s. 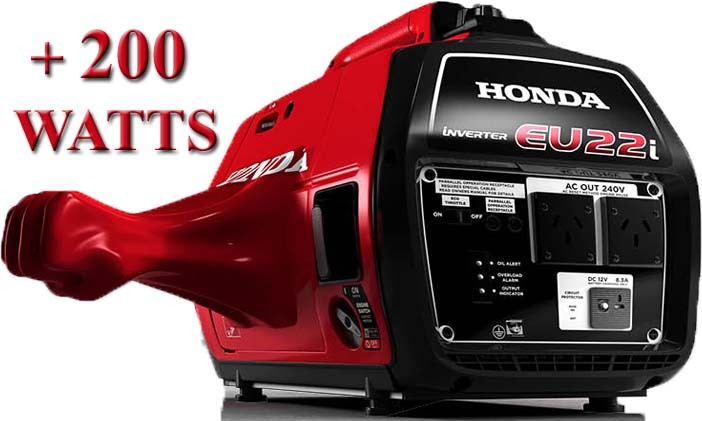 Honda actually claim it delivers cleaner electricity than the commercial electricity you get in your home. In other words, for a generator, it is quite and one of the quietest on the market. It means you can run it for a reasonable amount of time around the campsite and when it blends in with background noise during the day, it is possible your neighbour will not even notice it. There is an overload alarm built into the unit for times where the unit is overloaded and tying to use more than its allocated 2200 watts. To protect the engine the overload LED will light up red, and if the load continues after about 4 seconds, the current to the appliance will be cut off. The engine of the generator will still continue to idle. This will protect the generator from overload damage. The Eco Mode switch will allow the generator to automatically detect the load being placed on it depending on what appliances you have running. When appliances are turned on or off, the engine will adjust itself to the required load. This setting will assist in minimizing fuel consumption and reduce noise levels when less than full loads are applied. 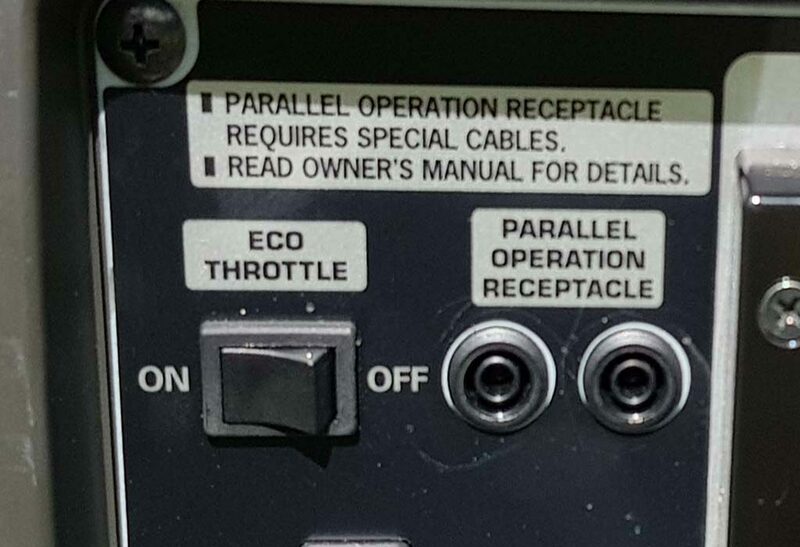 If you know in advance you will need the extra power you can leave this switch in the OFF position. With the Eco switch ON, it is possible the EU22i may achieve up to 8 hours of continuous operation time. These outlets allow you to link two generators together, thus doubling up on the amount of output watts. You will need specialised cables to do this. The cables can be purchased separately through your Honda dealer. One of the great things about the EU22i is that although it packs more power, they have been able to do it without increasing the size of the unit. At 21kg and 511mm x 290mm x 425mm the EU22i is the same dimensions as the old EU20i which means you can still store it in exactly the same compartments you may already have. 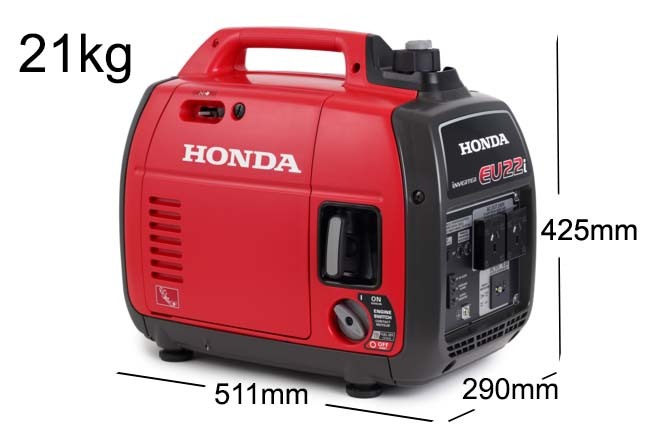 With a maximum output of 2200w it puts out 240v AC, but also has a 8.3 amp DC outlet which will allow you to run smaller 12 & 24 volt appliances and also charge automotive batteries at the same time. Overall, we were very impressed with the EU22i. During our initial test, we ran a Daewoo washing machine which runs at up to 1500w at its maximum. We left the air conditioner going as well as the battery charger and then also ran the stick blender which is 1000w. We left the generator on Eco mode and it handled all the appliances at one time. Granted the noise level went up a few notches but it certainly was able to cope with the load. What you do have to be mindful of however with any generator and electrical appliance is the extra power it will use on start up. I will cover this more in our article. Generators – Do you need one? And how to select the right one. Since the live test, we have been using the EU22i around our campsite and testing it on our main electrical appliances. For us, running the business from the Motorhome, charging all our computers phones and electrical equipment is a priority. Our major appliances include a household split system air conditioner which spikes at 1000w, our 7kg front load washing machine which can get up to 2200w, and we also use it for the battery charger to top up the house batteries after log periods with no sun. The wife’s hair dryer was interesting, as it runs at 2000w, but apart from excessive revving when she had it on the hot setting, the Genny coped well. Thankfully, she doesn’t use it often. You can see in the video review we ran all of these appliances and the EU22i handled them well. I have also shown how to access all the major service point for the generator. You can see Part 2 of the review here. Anyway, that is our take on the EU22i. For more info, you can go direct to the Honda Website where you will find loads more technical information as well as the many dealers where you can get one from.